Chosin: X Corps Escapes the Trap, is a two-player, intermediate-complexity simulation of the fighting in eastern North Korea in late 1950 in which the Chinese attacked the United Nation’s X Corps as it approached the Yalu River. One of the more famous incidents of the campaign was the US Marine Corps 1st Division fighting its way out of an envelopment at the Chosin Reservoir. 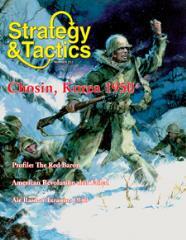 Chosin, designed by Joseph Miranda, covers the entire campaign using the same game system as Gauntlet, which appeared in Strategy & Tactics 190. The two games are compatible, and the Strategic Scenario included in this issue provides instructions, as well as extra units, to create a combined Chosin/Gauntlet game of the entire Chinese offensive of 1950. Players can also use the Chosin rules and charts to update Gauntlet. Each game turn equals one day. Each hex represents 2.5 miles (four kilometers). Units of maneuver are mostly UN regiments and brigades of 1,500 to 5,000 men, while each Communist divisional counter represents about 6,000 to 24,000 men. Each air UN unit represents 30 to 50 sorties. There are 280 NATO-style, small-size (half-inch) counters, including errata-fix replacements for Gauntlet. Special rules cover: naval gunfire support, aerial combat operations, air transport, aerial supply, naval supply and troop transport, limited intelligence, bridge destruction and repair, fog of war, meeting engagements, organizational integrity, entrenchments, partisans, special forces, combat engineers, and the possibility of atomic warfare. The short scenario will take two experienced players about four to six hours to complete.